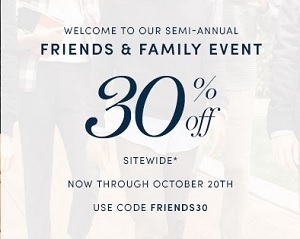 Friends & Family Event started at Cole Haan stores in the United States and online on the official website. Visit your nearest store and receive 30% discount on almost everything. Use code: FRIENDS30. Source of the information is Cole Haan. More details available at Cole Haan stores in the United States. Find your nearest store through our store locator.